They ought to call him The Sinister Santa. It is my sincere hope that many children will find this article and be shocked with the reality that THERE IS NO SANTA CLAUS! Parents who teach their children to tell the truth all year long, hypocritically turn around and lie to their children at Christmas about Santa. Santa Claus was designed to replace Jesus Christ. No parent should deceive their child about the Lord Jesus Christ, Who is the SOLE meaning of Christmas. The name "Santa" rearranged spells SATAN." Whether coincidence or not, Santa has allowed Satan to lead children astray from the doctrine of Christ, i.e., the Word of God (2nd John 1:9). 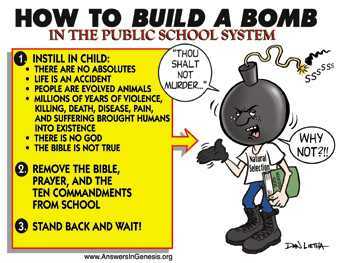 America's public school children are growing up confused, with no moral compass, devoid of the knowledge of God. Even worse, they're being brainwashed that there is NO God, and that the universe evolved over billions of years from stardust. From the lie of Santa Claus to the lie of Evolution, America's children are being woefully deceived. All we hear about at Christmas time is songs praising Santa Claus, Rudolph the Red-nosed Reindeer, Frosty the Snowman, Oh Christmas Tree, Jack Frost, Old Man Winter, Little Saint Nick, and so forth. Sadly, the name of Jesus is seldom if ever mentioned throughout the Christmas holiday. It is no coincidence that "Santa" rearranged spells SATAN! The average person is woefully ignorant of these obvious attempts to remove Jesus Christ from society. And then to add insult to injury, many ingrates refer to the precious Savior with an "X." I don't care what you say, the Word of God gives the Savior a name, and that precious name is JESUS! Anyone that says Jesus can appropriately be symbolized by an "X" is an idiot and a blasphemer. It is no coincidence that Santa Claus is given the same powers as God. This is an attempt to mislead children at a young age. Santa is given omnipresence and omniscience, knowing whether each child has been bad or good. Santa is given omnipotence, being able to visit every child's home in the entire world in a single night. This is something that only God alone could do. Santa is given the power to understand and speak any language, which again, is something that only God could do. Also, Santa is portrayed as being righteous, i.e., the "good guy," who is always happy, and is the higher moral authority. Clearly, whoever designed Santa Claus wanted to make children believe that he was a god. In addition, the entire concept of being rewarded by Santa Claus (an all-powerful, all-knowing, all-present being) for being good is a dangerous teaching. Children are being taught works salvation at an early age. No wonder the average adult today thinks that they might go to Heaven if they're good enough. Hmmm? I wonder where that teaching got started? It's the same naive parents who see no harm in teaching their children about Santa Claus, who also have no problem with their children idolizing Harry Potter's witchcraft. What is wrong with parents? The problem is that the average parent doesn't love the Lord Jesus Christ, and thus doesn't care about the Word of God. Santa is an imposter, cleverly designed to replace the Lord Jesus Christ in the mind of the world's children. The very same unbelievers who have no problem with children being taught about some mythical fat slob named Santa; go ballistic at the very mention of the precious name of Jesus. What a bunch of hypocrites! You can have a Jewish Christmas display, a Muslim Christmas display, or any other heathen religious display, and people don't mind; but those same hypocrites go insane when you set up a manger featuring the baby Jesus. Santa Claus is a cleverly conceived fraud, intended to rob children of their faith in Jesus Christ. Santa Claus is a wolf in sheep's clothing, an enemy of the cross of Jesus Christ... Philippians 3:18, "For many walk, of whom I have told you often, and now tell you even weeping, that they are the enemies of the cross of Christ." Please don't allow the malicious MYTH of Santa to brainwash your child. Satan has a bid for your child mom and dad, and he'll use Harry Potter, Santa Claus, Lyra from The Golden Compass or any other Satanic deception to lure your child away from God's Word. We are living in apostate days where, as the church becomes more worldly, so is the world becoming more churchy. So many religious people today talk about God and truth; but the Word of God has been completely abandoned. Anytime you hear someone like Oprah Winfrey talking about spiritual matters, but they never mention the Word of God, you know that the Devil is involved. Santa Claus never mentions God or the Bible. The whole notion of Santa is void of God; thus, it is heathendom. Children must be taught the Word of God. Proverb 22:6 instructs, "Train up a child in the way he should go: and when he is old, he will not depart from it." A parent who deceives their child about Santa is sinning horribly against that child. A child loves toys and gifts. In fact, this is what children think about most of the time. So when you mislead a child to believe that all good things comes from Santa Claus, you are effectively causing that child to think about Santa all year round. In sharp contrast, James 1:17 states... "Every good gift and every perfect gift is from above, and cometh down from the Father of lights, with whom is no variableness, neither shadow of turning." Biblically, all "good gifts" come from God. Yet, heathen parents mislead their children to think that good gifts come from Santa Claus. Thus, the teaching of Santa Claus is a direct ATTACK against the Scriptures and Christianity. Romans 10:17 states... "So then faith cometh by hearing, and hearing by the word of God." It is the Word of God that increases a child's faith; not the nonsense of Santa Claus. It is a sin for any parent (Christians included) to mislead their child to believe that good things come from Santa. The Bible plainly states in James 1:17 that ALL "good gifts" come only from God. Please teach your children that Santa is a Satanic deception and that Jesus Christ is the One to Whom we should be singing Christmas praises.